Arrival at Marrakech Airport and transfer to the riad where you will spend the night. Marrakech is a colourful city and most people head for the central square of the Djemaa-el-Fna beneath the imposing tower of the Koutoubia Mosque. After breakfast we leave the hustle and bustle of Marrakech as we head towards the looming High Atlas. 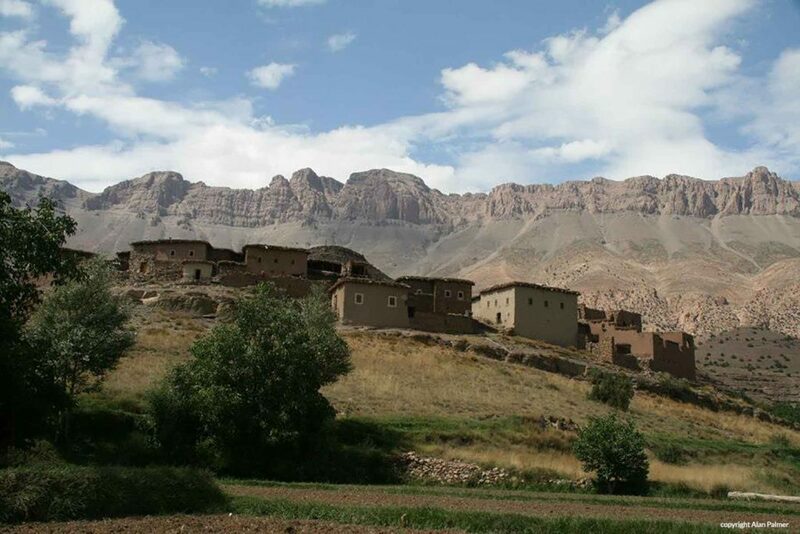 On reaching Asni, we leave the main road and drive into the foothills of the High Atlas. Our drive follows the pretty Mizane Valley until we reach the hamlet of Imlil (1740m) where we meet up with the trek team and join our trail. This whole area was in Martin Scorsese’s epic “Kundun” when it was transformed in a “Tibetan” backdrop to tell the story of the 14th Dalai Lama. 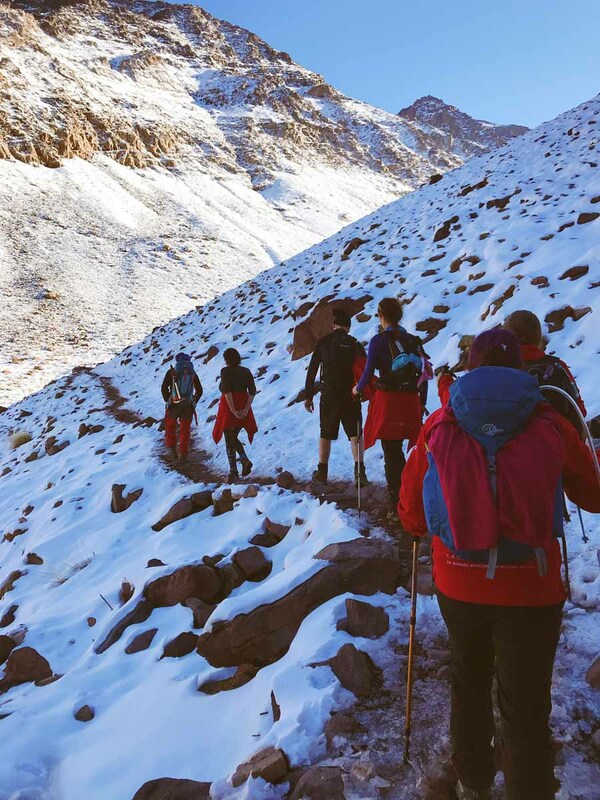 The trail is rugged underfoot as we gradually ascend for approximately 2 hours to the holy shrine of Sidi Chamharouch (2310m). A large white painted boulder apparently marks the location of the mausoleum of the legendary King of the Jinns (Chamharouch). 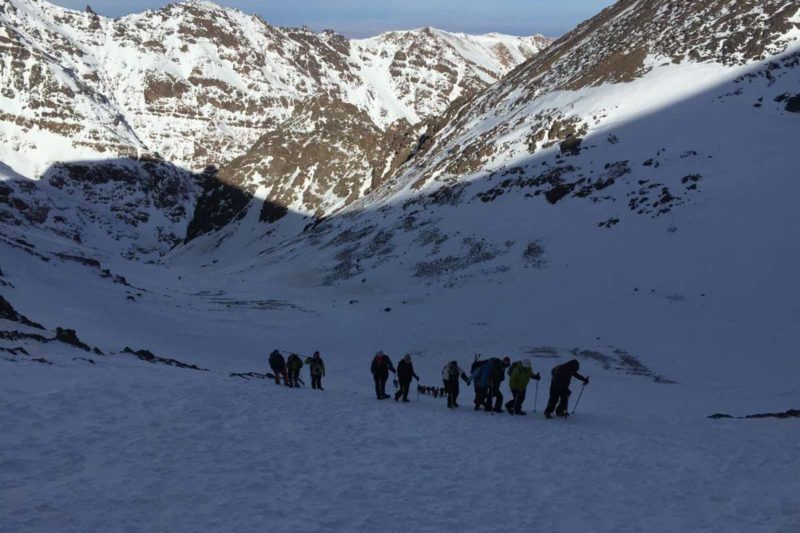 Next a gradual climb of approximately 4 hours has us reaching the area of the Neltner Refuge “Toubkal Base Camp” (3207m) and the location for our first exciting night under canvas. 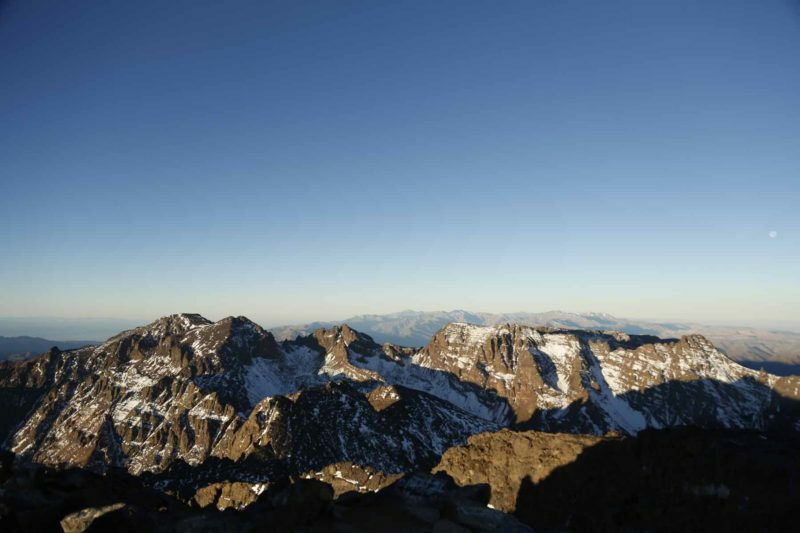 North Africa’s highest peak. 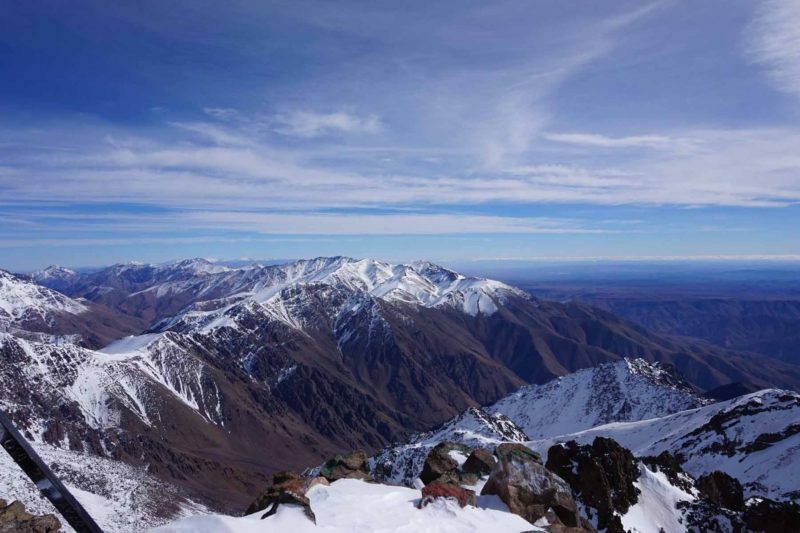 Initially we leave camp and start a steep ascent on a zig-zag route which snakes it’s way though scree and boulders. 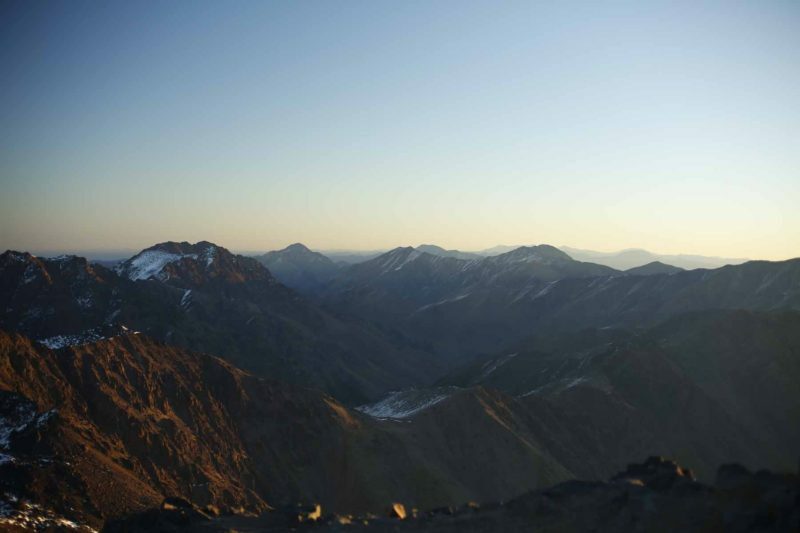 As the sun starts to rise, we pass two guardian peaks and the occasional patch of old snow. 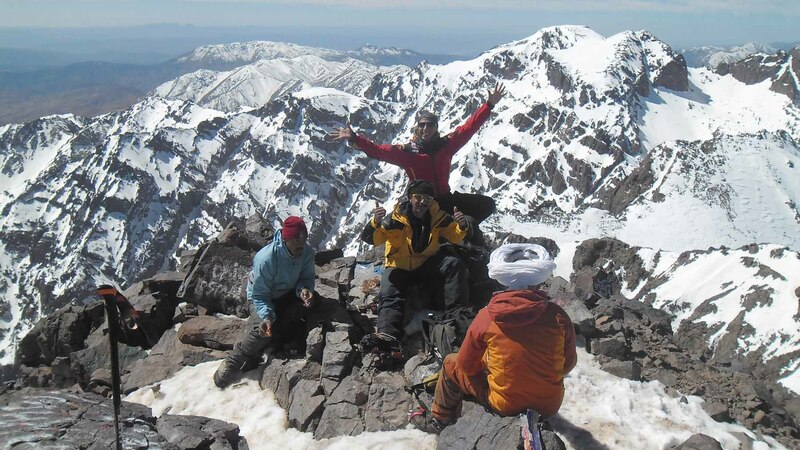 As we continue upwards the views becoming more impressive and after approximately 3 to 4 hours, we arrive on the summit and the reward for our hard work is a breath taking panorama! We are surrounded by the peaks of the High Atlas, the hills of the Anti-Atlas and Jebel Sirwa, whilst away to the south lies the Sahara. 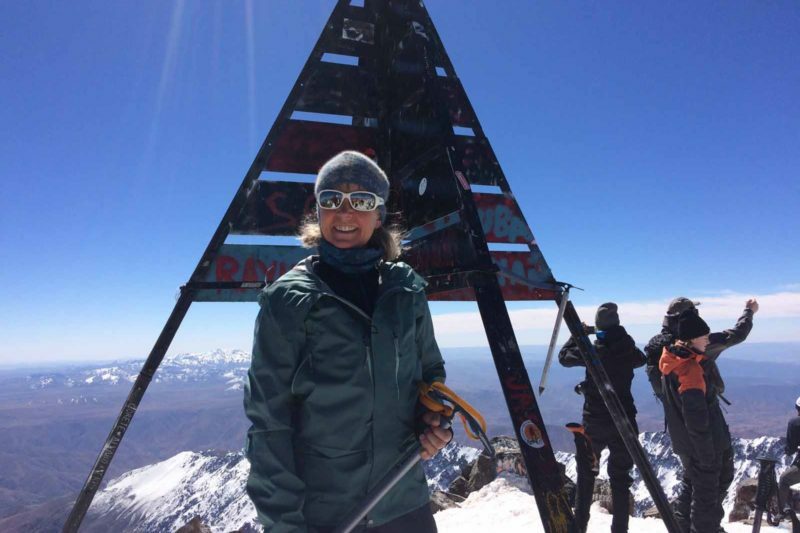 After taking in the views and plenty of “summit photos” we descend back to the hut in approximately 2 hours. After a much needed rest for lunch and tea at the camp we ascend down the valley to Tamatert where you will spend the night at a guesthouse. After the last two challenging days we can enjoy breakfast in the gite before enjoying a short walk down to Imlil. Here we pick up transport for our transfer across to the Central High Atlas. 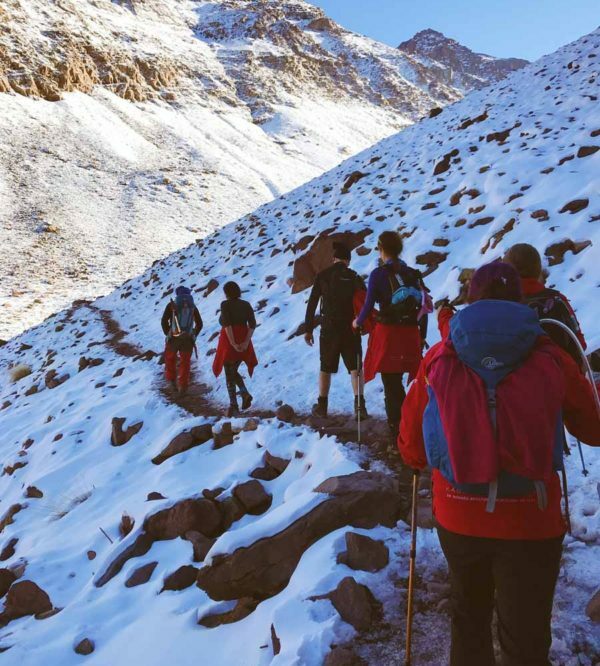 The journey across to the Bougmez “Happy Valley” takes approximately 6 hours and passes a rich variety of contrasting scenery and the opportunity to sit back, rest, enjoy the views out of the window and prepare ourselves for the next few days. During the drive we’ll pass through the olive farms of the Marrakech and the foothills of the Middle Atlas before the road curves towards the Central High Atlas. 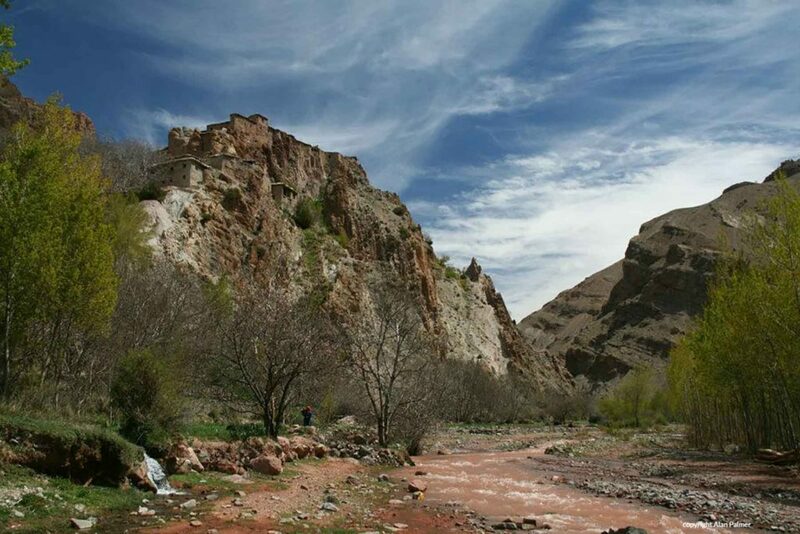 On reaching the Central High Atlas we’ll enjoy a relaxing lunch stop and have the opportunity to stretch our legs with a short walk before enjoying the remainder of the drive which sees us arrive in the village of Arous. 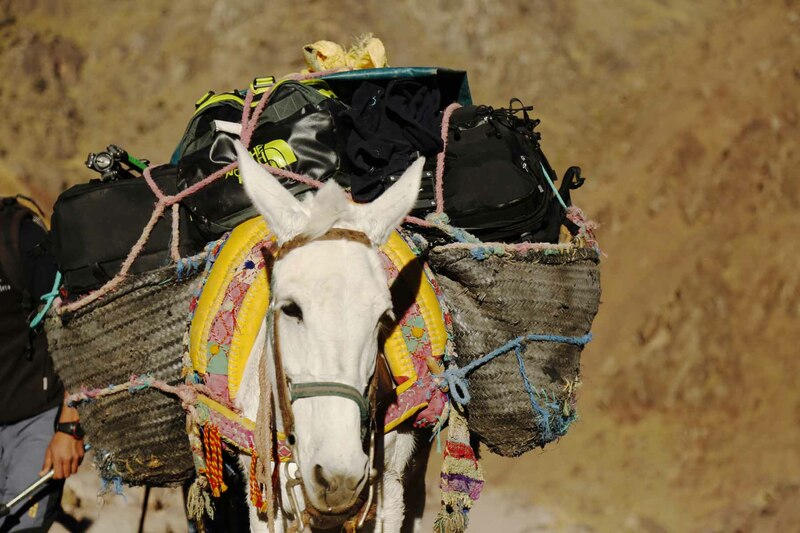 Here we meet our mueteers and their mules who load up our bags whilst we enjoy a much welcomed leg stretcher approximately 2 hours to the Ikkis Valley. After passing the village of Ait Said we set up camp at 2300m. Today we are rewarded with our first views of the Mgoun Mountain range as we leave the green valley behind and make our way into the heart of the mountains! After breakfast we leave camp and prepare ourselves for a steep ascent up to the Aghouri Pass (3400m). On reaching the top we’ll enjoy a well-deserved break and take in the views. This whole area is known for the nomadic shepherds that venture up to the high pastures to graze their flocks during the summer months before heading down into the valley for the winter. The region is also known for its “azibs” or dry stone sheepfolds used by the shepherds and we should see these whilst we are trekking today. 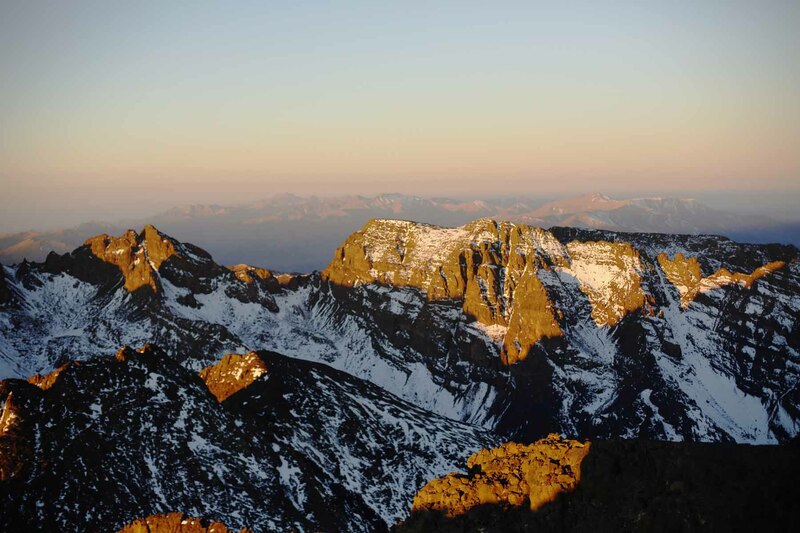 Next we descend down to the Tarkeddit Plateau (2900m), the location for our camp tonight. 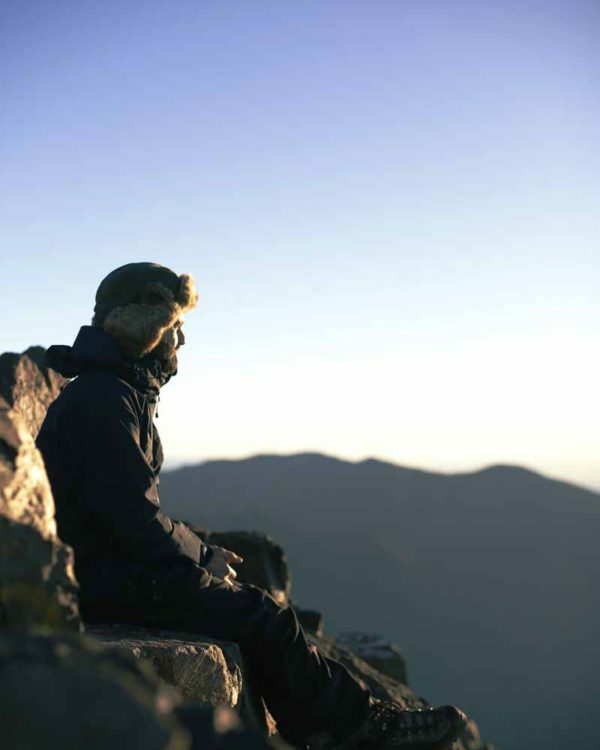 The remainder of the afternoon is left to relax and prepare for our summit attempt tomorrow. Tonight we sleep at the foot of Mount Amsound and in the shadow of the incredibly beautiful Mount Mgoun. 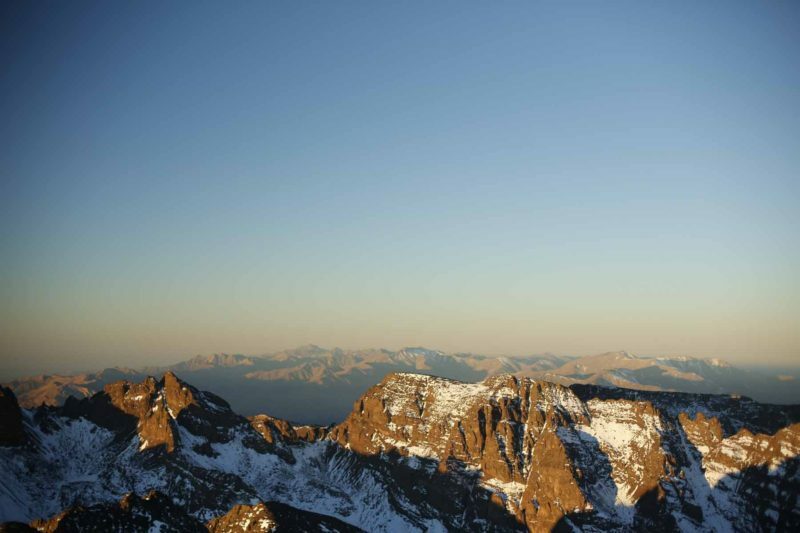 An early start is needed today for the exciting summit attempt on Mgoun. 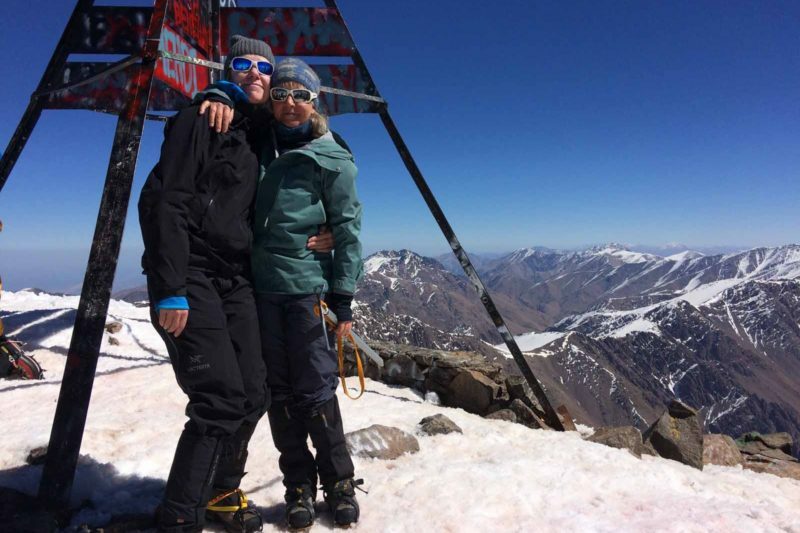 As the third highest peak in the Atlas range, this beautiful mountain offers an experience that feel more like an expedition due to its remote location and lack of trekking groups. 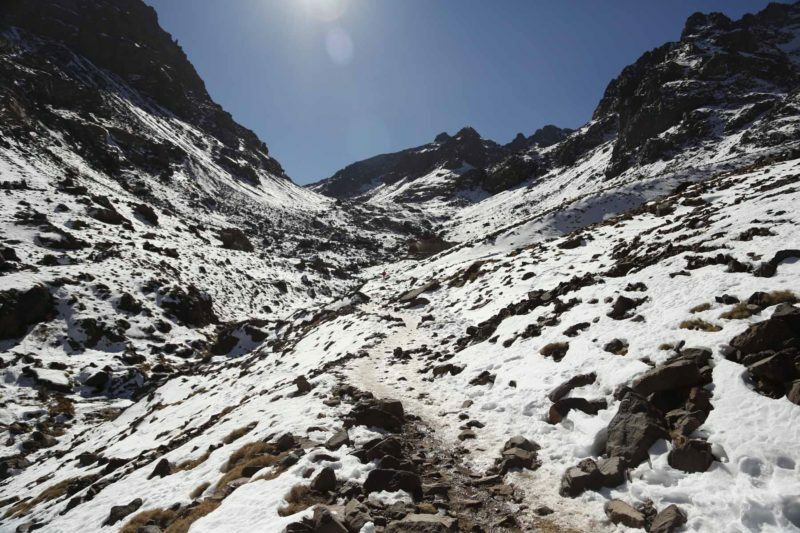 The initial part of our trek sees us leave camp and make our approach to the magnificent long ridge of Mgoun. The full Mgoun massif runs for over 30kms with the majority of it standing over 3000m. Our route takes us onto the ridge which if we are very lucky we’ll be able to spot many fossils along the trail. 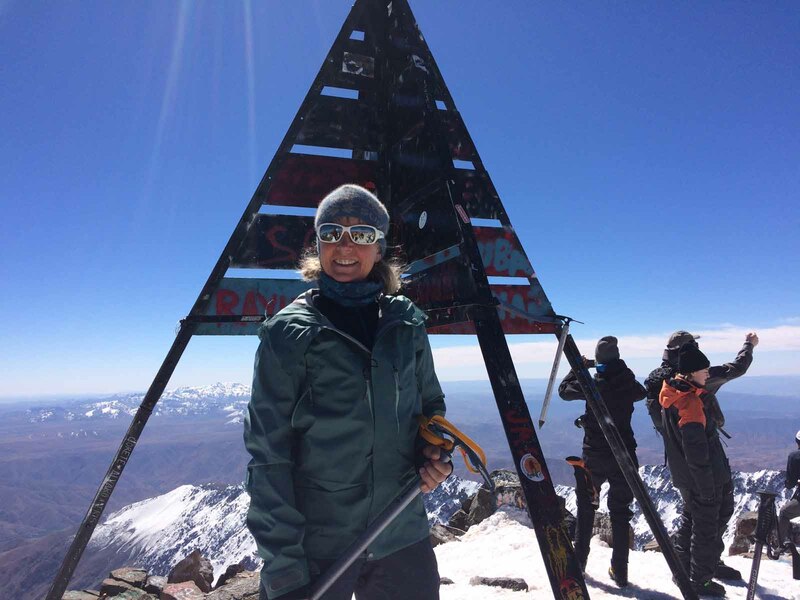 The summit of this majestic giant is 4068m and weather permitting from the top we will have a 360 degree view over the longest mountain range in Africa – the majestic High Atlas which runs for over 800km. 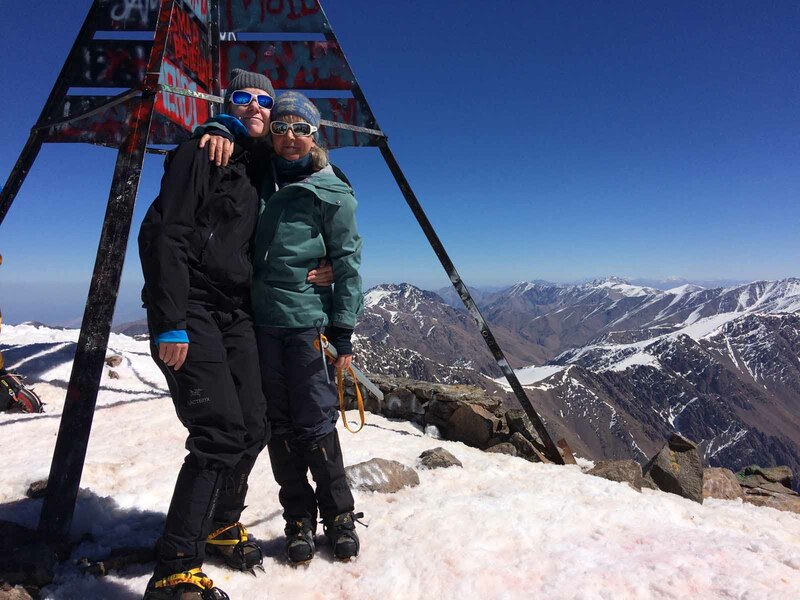 After taking in the views and all important summit photos, we descend steeply on trails of scree until reaching the Oulilimt Valley (2600m). Our camp on the valley floor will look extremely welcoming after a long day and dinner will most certainly be enjoyable! 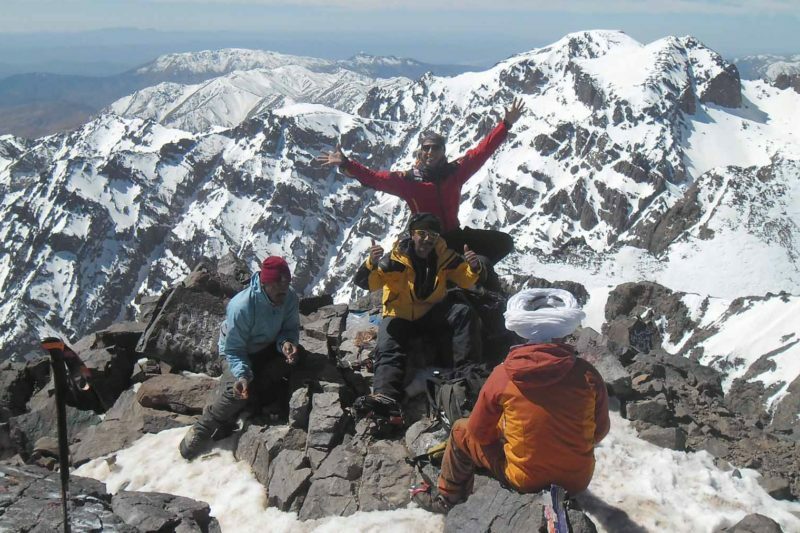 After breakfast and we start on a rugged trail which gradually ascends up to the Tizi n’Ait Imi (2905m). 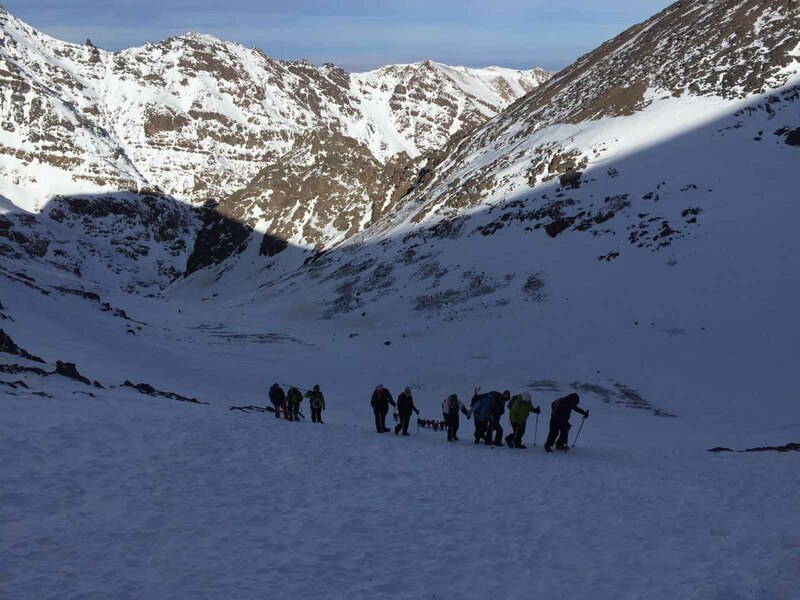 This is our only major ascent today and the route we follow is used as a passage for the Ait Atta and Ait H’med nomads who take their flocks up to the high mountain pastures. The Ait Atta is a large Berber tribe which originated in the Jebel Sahro region of Morocco and is known for its Nomadic lifestyle. From the top of the pass we have a fantastic panorama of the Bougmez “Happy Valley.” This pretty region of Morocco is little visited by trekking group and of often referred to as “Morocco’s Shangri La.” An area of orchards and high pastures surrounded by high mountains, the Bougmez or Happy Valley is known for the friendliness of the people and simplicity of life. 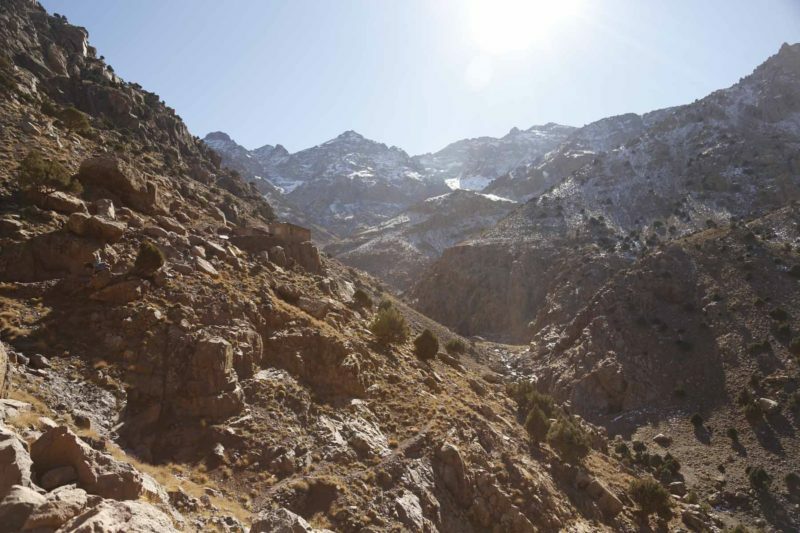 From the pass we follow a beautiful path that zig-zags down to the sacred source of the sacred sources of Ait Immi with its seven mills in the upper part of the Bougmez Valley. Tonight we stay in the hamlet of Agouti in a welcoming but simple gite with showers! The gite also offers a traditional hamman that can used for a small fee. This morning we transfer (4 hours) from Agouti to Marrakech and plan to arrive early in the afternoon and spending the night in a riad. Marrakech is a great place to wander and part of the experience is losing yourself in the souks and haggling for colourful souvenirs. The city has a number of gardens and the Jardin Majorelle also known as the “YSL Garden” is a lovely place to visit. Since 1980 the botanical garden was owned by the French fashion designer Yves Saint Laurent and his ashes were scattered there after he passed away in 2008. In the evening the Djemaa el Fna is a great place to watch the world go by and there is a rich assortment of food stalls to grab a quick snack alongside tourist and locals! Transfer back to Marrakech Airport and departure.